LONDON (AP) By the time Britain's Anthony Joshua won a thrilling tiebreaker to claim the final gold medal in the London ring Sunday, every fighter from the most successful men's boxing team in Olympic history had already been eliminated for five days. Although middleweight gold medalist Claressa Shields and bronze-winning flyweight Marlen Esparza saved the Americans from going home empty-handed, the nine U.S. men in London are returning with no shiny souvenirs. "It's not the way we wanted to go out," U.S. assistant coach Charles Leverette said. "It's tough to take." 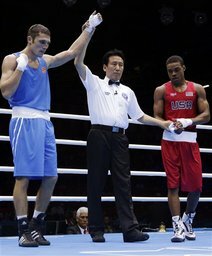 Among the few modern events that date back to the ancient Games, boxing has developed into a more safety-conscious sport at the Olympic level, primarily based on judges' scoring. That's quite a leap from the barbarism of the 7th century B.C. in Athens, where boxers didn't wear gloves and could lose only by knockout or admitting defeat. Learn about how electronic scoring works, the various ways to win a bout and prepare yourself for something unseen in Summer Games history: the female boxer. Boxing Events for the 2012 London Games have been completed.